On Wednesday 23 September 2009, sixteen countries have officially expressed their support for the new UN Convention 'Rotterdam Rules' during the official Signing Ceremony in Rotterdam, the Netherlands. These States signed the Convention, which describes the rights and obligations involved in the maritime carriage of goods. Important seafaring nations such as the United States, Norway, Denmark, Greece, France and the Netherlands are among the signatories. The Rotterdam Rules bring more clarity regarding who is responsible and liable for what, when, where and to what extent when it comes to transport by sea. The Rotterdam Rules will give world trade a boost considering that 80% of world trade is conducted by sea. If the same law applies all over the world, this will facilitate international trade by making its underlying contracts and documentation more efficient and clearer. The UN Convention has opened for signatures since 23 September 2009: click here to check the actual amount of States, which have signed the Rotterdam Rules. The official Signing Ceremony took place in Rotterdam, the city after which the UN Convention is named. The following States have signed the Convention on 23 September 2009, the first day the Convention has been open for signatories: Congo, Denmark, France, Gabon, Ghana, Greece, Guinea, the Netherlands, Nigeria, Norway, Poland, Senegal, Spain, Switzerland, Togo and the United States of America. Please check aforementioned link for the actual amount of States, which have signed the Convention. The Rotterdam Rules are the first rules governing the carriage of goods by sea and connecting or previous transport by land. This land leg used to require separate contracts. Responsibility and liability during the whole transport process are clearly demarcated. Furthermore, the Convention puts in place the infrastructure for the development of e-commerce in maritime transport. This will lead to less paperwork. The shorter turnaround times will reduce the chance of errors and lower costs. The Rotterdam Rules are the result of inter-governmental negotiations that took place between 2002 and 2009. These negotiations took place within the United Nations Commission for International Trade Law (UNCITRAL) after the Comité Maritime International (CMI) had prepared a basic draft for the Convention. 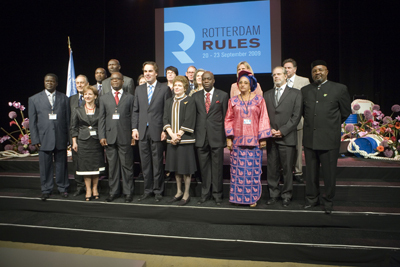 On 11th December 2008, the General Assembly of the United Nations adopted the Rotterdam Rules.